If you love whipping up tasty desserts and other baked goods, Cookware Brands’ bakeware products are sure to delight. Whether you’re mixing a batch of cookies, decorating a triple layered sponge cake or simply transporting a batch of tasty cakes or cupcakes, our range of high-quality baking products has everything you need to bake delicious treats. From spoons, cupcake moulds and springform pans to cookie cutters, silicone spatulas and cake lifters, you’ll find all the best bakeware brand at unbeatable prices, including Cake Boss, Anolon, Circulon and RACO. 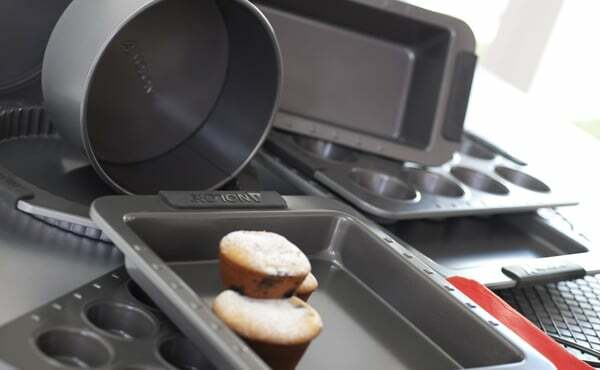 Our baking accessories can also make the perfect gift!